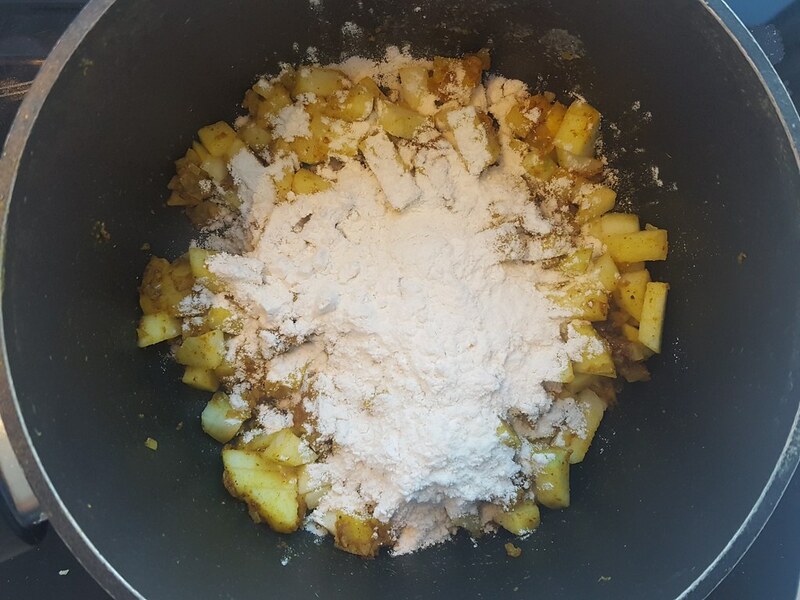 Today I would like to share a very old and traditional Danish recipe. This Danish recipe is called Boller I Karry which directly translated into English would be Danish Meatballs in Curry. I remember having had this dish since I was a kid and that it was one of my favorite. 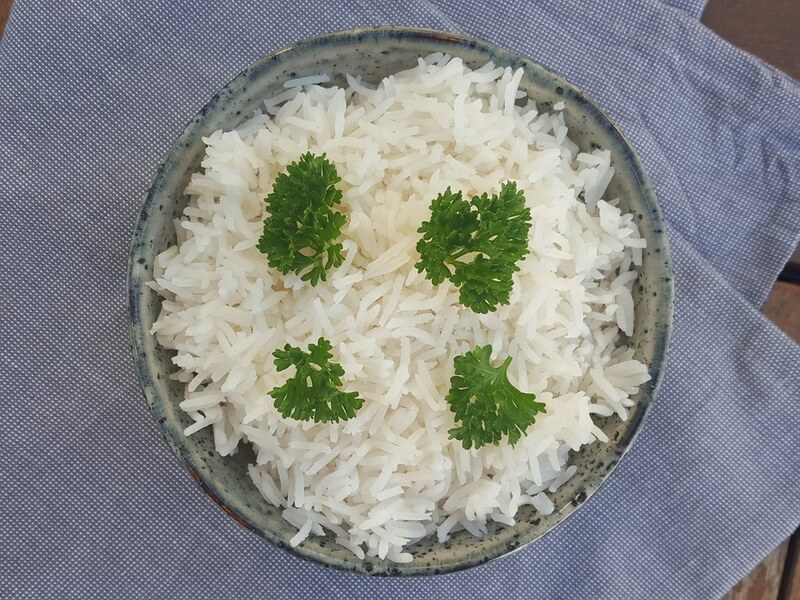 I know that my mother also liked making this dish because it is tasteful and easy to prepare. The dish has a curry sauce and is served with rice – both ingredients which are originally far from Denmark. Despite that, this dish is a traditional Danish dish and has been served in Denmark for many, many years. I would not say that curry is a particular important or that popular spice in the Nordic kitchen. However, we do use curry and this dish is probably one of the most popular recipes where we use this great ingredient. As said above, it is quite easy to make this dish. The dish consists of three main parts; the meatballs, the curry sauce and then some cooked rice. 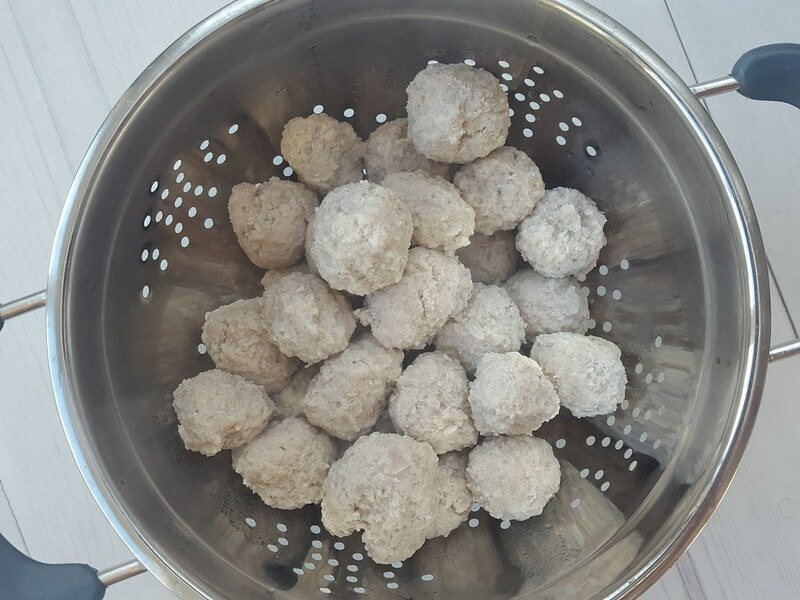 The meatballs are made from ground pork which are mixed with an egg, flour, milk, salt and pepper. 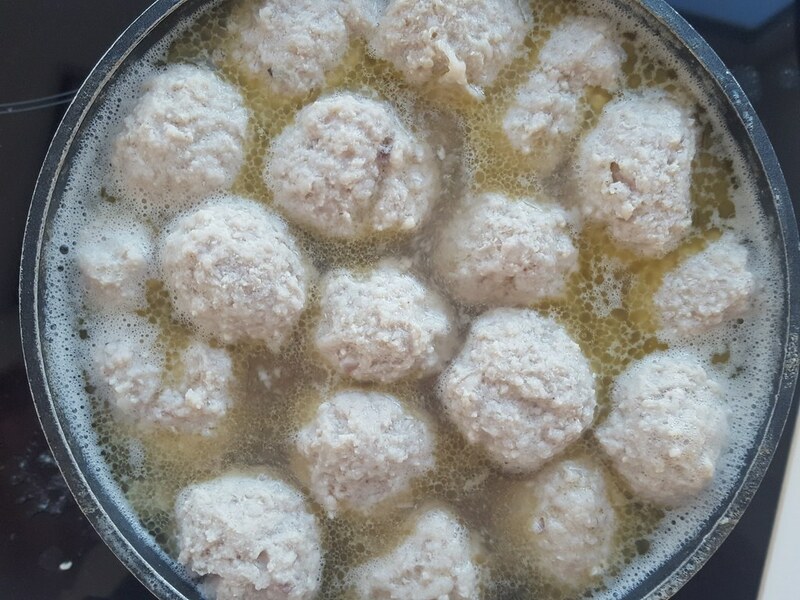 The special about these meatballs are that they are cooked in boiling water and not fried. This gives them a nice spongy feeling and a great taste. 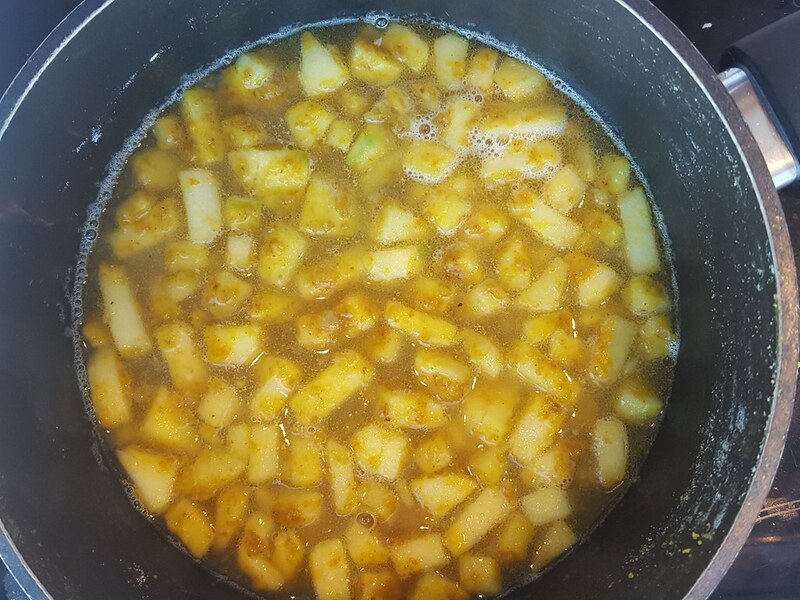 The curry sauce is mainly made from curry, water, onions, and apples. The sauce gets a very delicious and rich taste and together with the meatballs and some rice, this is a super dish. Remember that curry is a mixture of different spices and the it can differ in taste from brand-to-brand and from county-to-country. 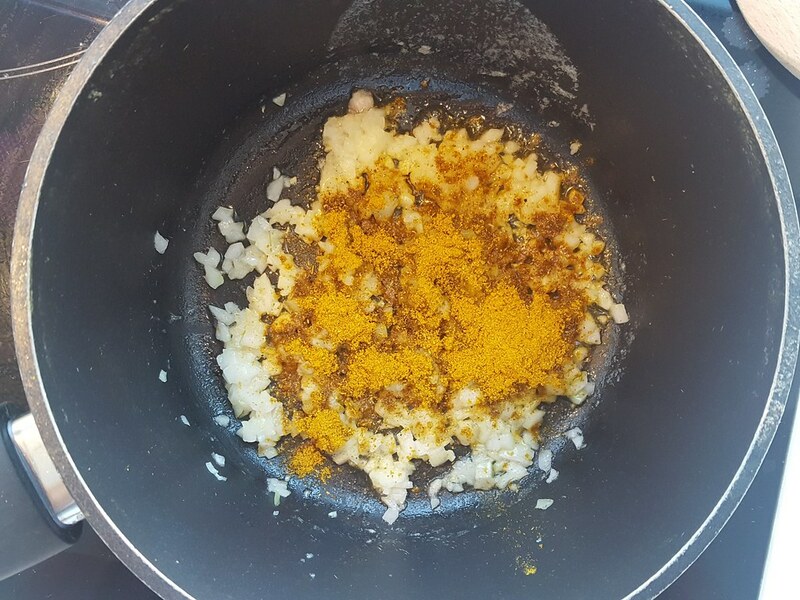 I will recommend you to start by adding half of what I have listed in the recipe and then add some extra if you like a stronger curry taste. 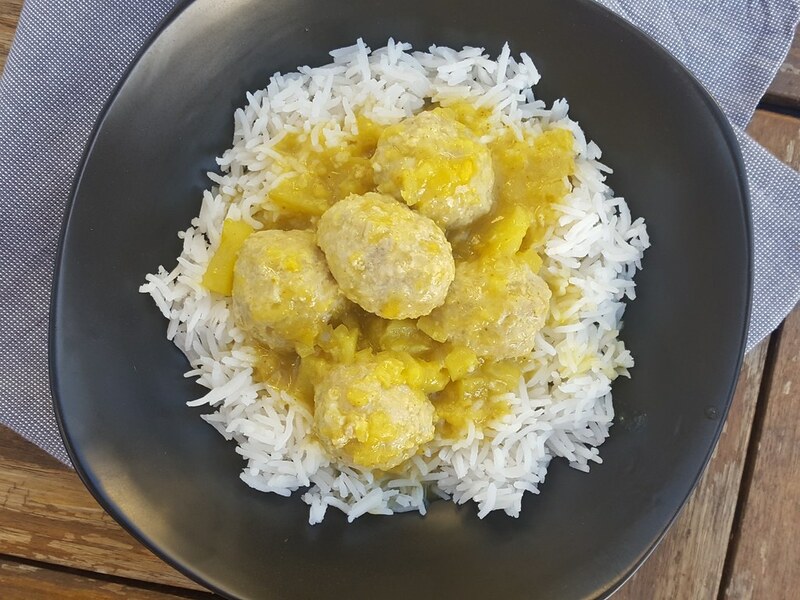 The curry sauce and the meatballs are traditional served in the same pot and then together with a bowl of freshly cooked rice. Then you mix together the two parts on you plate as you like. 1. Peel the onion and dice it. 2. In a bowl; mix all the ingredients together. 3. In a large sauce pan; add about 1 liter (1/4 gallon) of water. Turn on the heat and let it heat up until boiling point. 4. 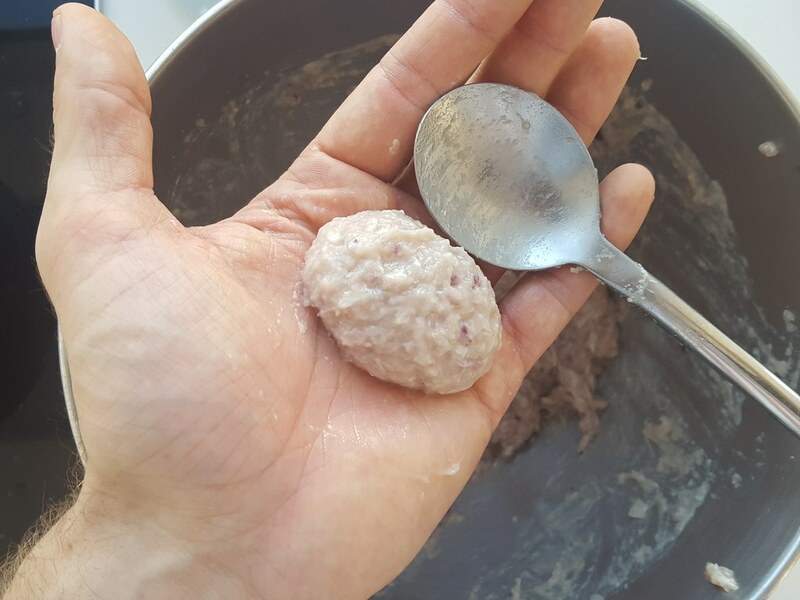 Using a table spoon and your hand palms; create small meatballs and put them into the boiling water. 5. Boil the meatballs for about 10 minutes and put them in a strainer to let the water drain away. Save the water used to boil the meatballs – this will be used to make the curry sauce in the next step. 1. Peel the onion and apple and dice both. 2. 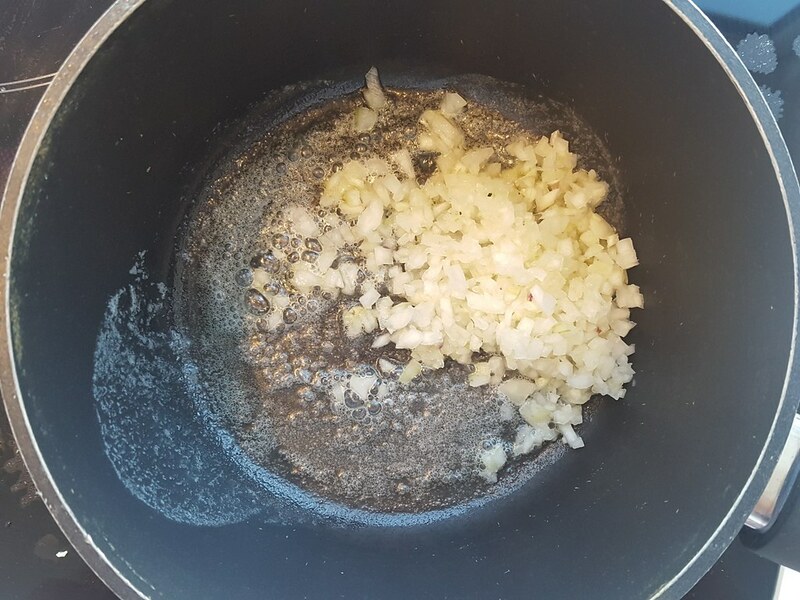 In a sauce pan; add some oil and fry the diced onions for about one minute. 3. Add the curry and fry for another minute. 4. 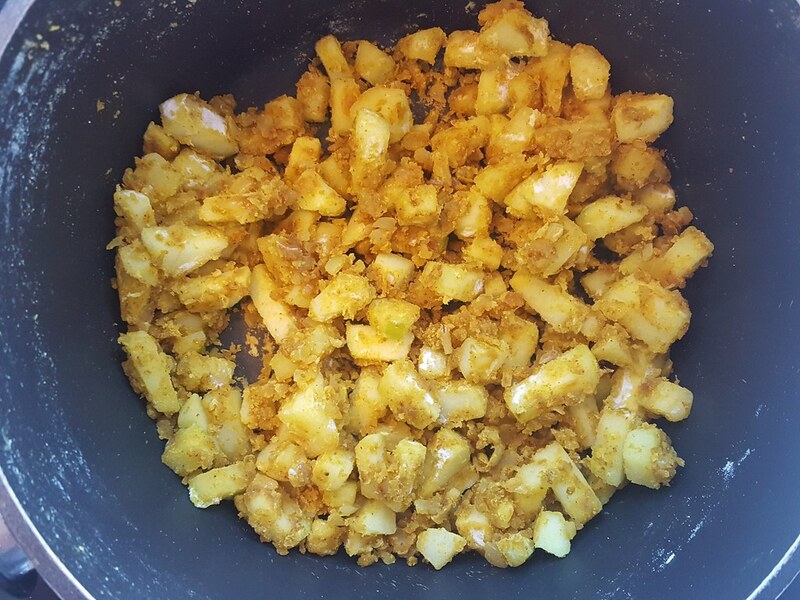 Add the diced apples and fry again for one minute. 5. Add the flour and mix everything together until the flour is completely soaked by the moist from the apples and onions. 6. Add 6 dl (2.5 cups) of the water from the boiling of the meatballs. Let it simmer on low heat for 15 minutes. 7. I personally prefer the curry sauce with pieces of apples. 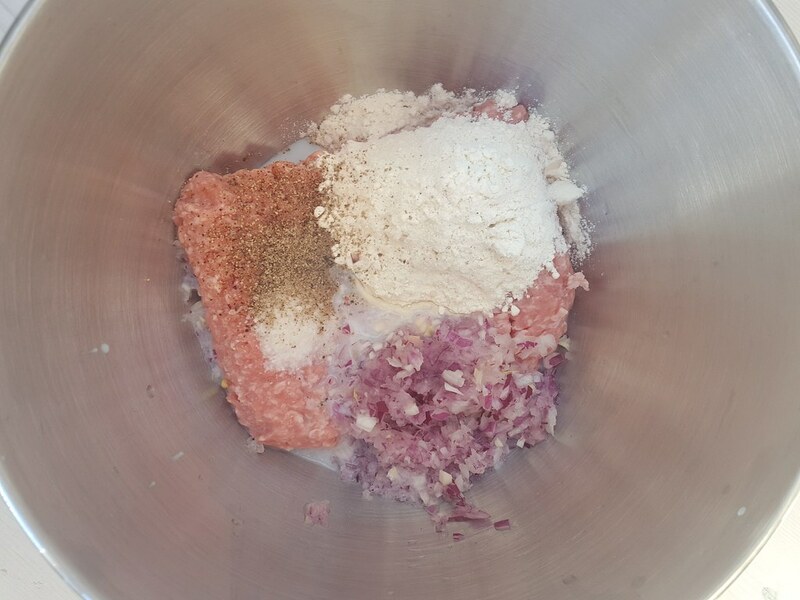 However, you can also blend the sauce using a hand blender if you prefer a smooth consistency. 8. Finally, add the meatballs to the sauce and let them heat up for about 5 minutes. 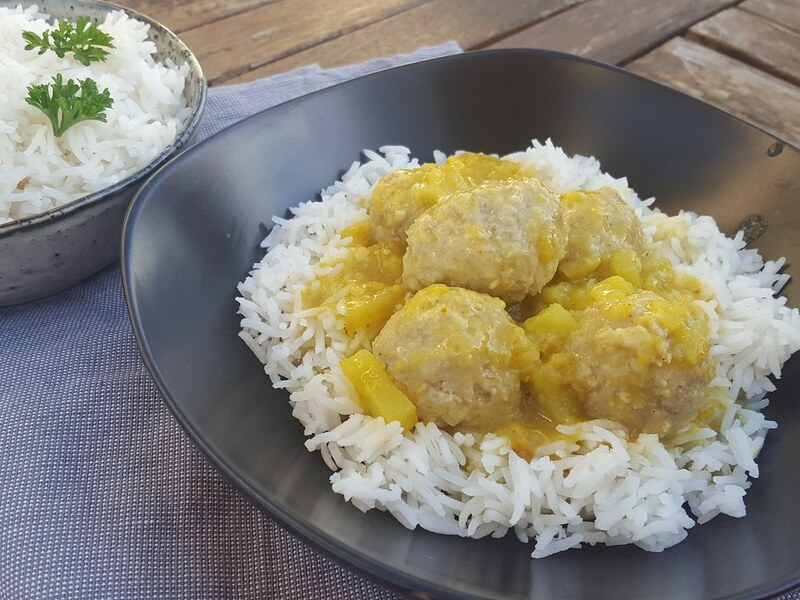 Serve the meatball and curry sauce together with some boiled rice. Hi. What side dishes are served with this? Thanks. I tried this tonight only with some cream in the sauce. It was great. Some of my ancestors were danish and my husband is Indian so it makes a nice dish for us! Try green beans. A Danish friend of mine served it with a side of green beans ( not to replace the rice though). 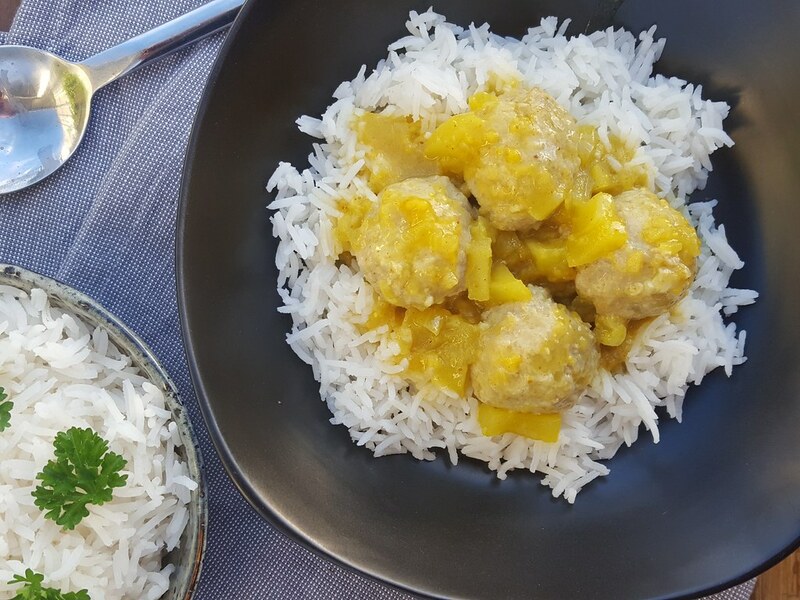 I love white rice with curry always my favorite with danish meatballs makes it more delicious. My background is Danish. When my mother passed we lost her recipes. One I’ve been looking everywhere for is a sweet and sour meatballs that is made with vinegar and sugar. Ever come across this type before? I’m going to try some of your recipes. They look yummy, but with a newer flair to them. The rye bread I remember was heavier and when you slice them you make it very thin. For them it was the standard for open face sandwiches. HI, I first had this dish in college when a Danish exchange student cooked it for me. It was delicious and I have made it since then because I begged her for the recipe. She did serve it with a side dish of green beans, which went nice with the curry on top. Al in all, it’s a beautiful, healthy, and delicious dish. Thank you! They should be firm but still soft. It’s hard to describe.